Small .4 preview – some new UI teaser screens! Wanted to show you some WIP screens as we work on getting .4 out the door. It’s been a while, but we’ve made tremendous progress with the new build! 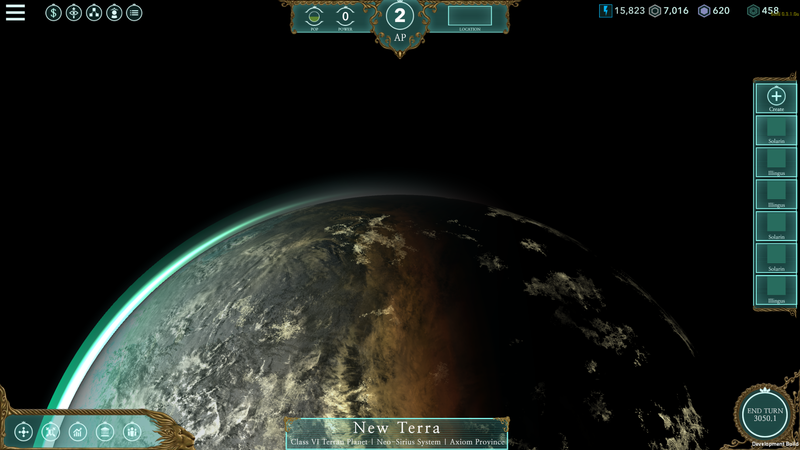 We’re going to have all 3D planets and stars, a completely new UI, and we believe even easier ways to access the information you need in conjunction with the Command Modes! Anyway, with the exception of the Project Screen, all screenshots are from a live build of Imperia! This is the mostly-ready-to-go main UI. Note the resource bar on the top, the Projects in progress bar to the left, and the sub screen buttons have been completely redesigned and moved to the upper-left, while the next-turn button has been segregated and the date added. The huge addition is the Emperor Status bar, with your remaining AP in bright white, as well as your Power, your Popular support, and your location in an immediate place to find always. We rebuilt the UI with the viewpoint that you, the player, are the Emperor and what is most important for you to know always? This is the new WIP Projects Screen. Along with Actions that you do with Characters in the game, Projects are the most powerful tool you have to shape your Empire and change the game. They also define how you shape your relationships with your Characters – it is considered prestigious to be part of an important Project, but having different Characters from different Houses – especially ones that do not like each other – will slow down the progress. Actually creating a Project is as easy as dragging and dropping in an Administrator, then adding additional Contributors that add money and ADM to the project, and we wanted the window to reflect the information that you need to know, as well as creating several filter tools to best find certain Characters. The start of the Setup New Game screen. 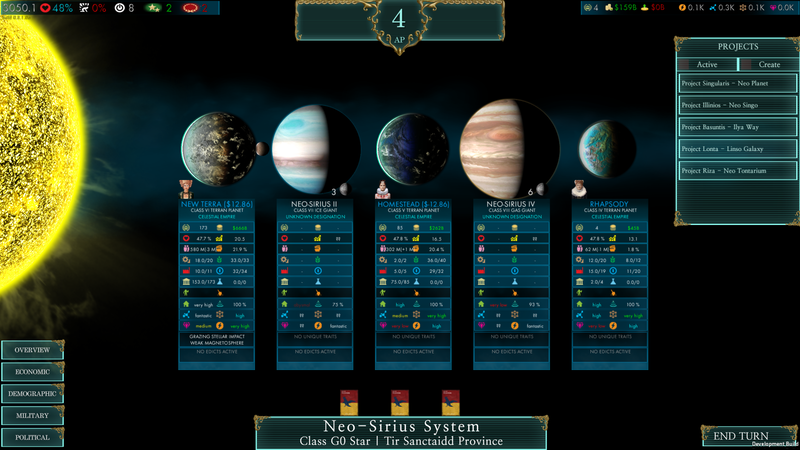 You will also be able to select your empire’s emblem here, as well as set the # of AI civilizations. The next step is where you will design your Emperor. We’ll post more pictures soon, as well as a new video so you can see this stuff in motion! But we’re very excited about the direction of the UI in Imperia! In the wake of Stellaris – we’re still plugging! Well, we know what huge game just came out and hey, it’s Paradox and they make amazing games, so while everyone was out playing Stellaris (yes, we all got it as well, and played a LOT of it!) we are continuing to work on .4, otherwise known as The UI Release. As you can see in the featured image, we’re revamping to the foundations, including fully-3D planets and stars that move, show rotating moons, and have their own light sources and show the amount of population and development on the planet! We’re also added a new artist to our stable, and he is doing incredible things for the UI design! You can see a preview of the ‘retro-futuristic’ look we’re going for above. We’ve put a lot of time and effort into the command modes and the UI switches for each, revamped the galaxy view navigation, and worked on optimizing the system transitions. We’ll be posting a more detailed blog about the redesign soon, along with a blog talking about the planets in Imperia – they are much more detailed beneath the surface then you might think! As Imperia is developed and grows, like all games, it started out as an idea. Maybe just a germ of an idea, or perhaps an incomplete vision, but nonetheless all great works of all media types start with an idea. A seed. And then comes the water of hard work, the soil of daily progress, and the occasional bugs of failure. But what happens when you finally have a sturdy little plant that can more or less stand on its own, without the help of the soil or a frame? You want more. More plant, bigger plant, more everything. And that is where Imperia stands. As of .311a, it’s a complete computer game in the sense of a game. It has a start, a win condition, a lose condition, an AI presence, a way to save and load, and it is pretty much stable. What it does not have is the totality of my original vision. What I envisioned with Imperia is the awesome responsibility of running an star empire. The majesty and awe that such a persona must engender! And how could I, with my very limited art skills, every bring across that feeling? Well, someone with vastly more talent in this department than I has asked to help with the art direction and has already started to contribute. You can already see their work in the revised title screen and UI; over the next several months you will see much more. A throne room, where your new month will start – what will you do? How will you rule? And there will be new faces – your characters, your viceroys will come to life! There’s a lot coming down the pike, and I’m excited to bring you a small preview. Stay tuned!! !